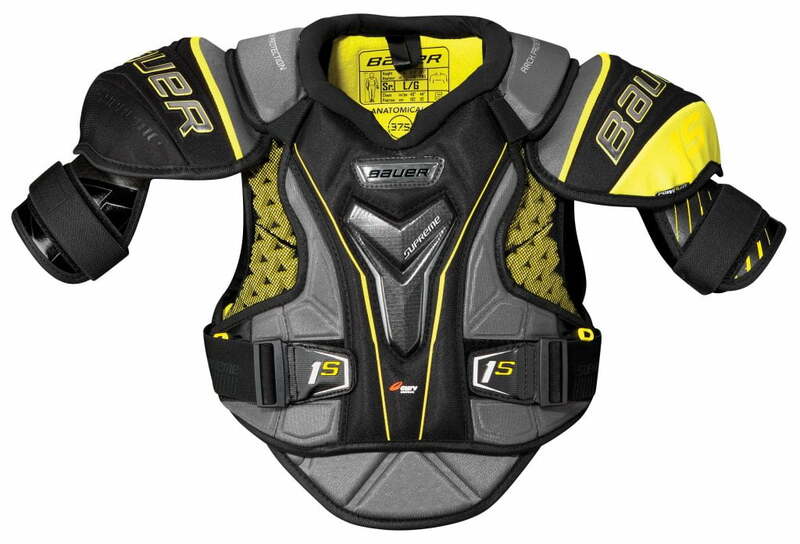 Bauer Supreme 1S Junior Shoulder Pads | Sports Etc. Designed to fit like an extension of the body, the new SUPREME 1S shoulder pads are unlike any pads today. Featuring Curv® composite with POWERLITE, the 1S takes fit and protection to a new level. Strategically placed in the sternum area, FleXorb, combining revolutionary G-FORM® and XRD®materials, absorbs energy from the impacts of the game to protect players. Players get the ultimate anatomical fit with POWERLITE technology—a lightweight, moldable foam that contours to a player’s body. Combined with Curv® composite in main impact areas, this helps players be ready for the game’s battles. 37.5® Technology integrated with BAUER products evaporates sweat, drying fabric at an incredibly faster rate than competitive base layers. This technology is proven to increase performance, keeping body temperature at an ideal level and giving players more energy to win the third period. Along with 37.5® Technology, the liner in the 1S Shoulder Pad now features Sanitized® odor-resistant treatment, which protects against bacterial and fungal growth for enhanced odor control. Sports Etc Performance To Value Rating– 8 Out of 10– When your game calls for the best protection available this is the shoulder pad for you.